Image Size: 26 X 27 in. Now is the time to commission your print to be countersigned by the surviving members of Doolittle’s Raiders attending the 68th Reunion at Wright Patterson AFB in Dayton, Ohio, April 16-18. 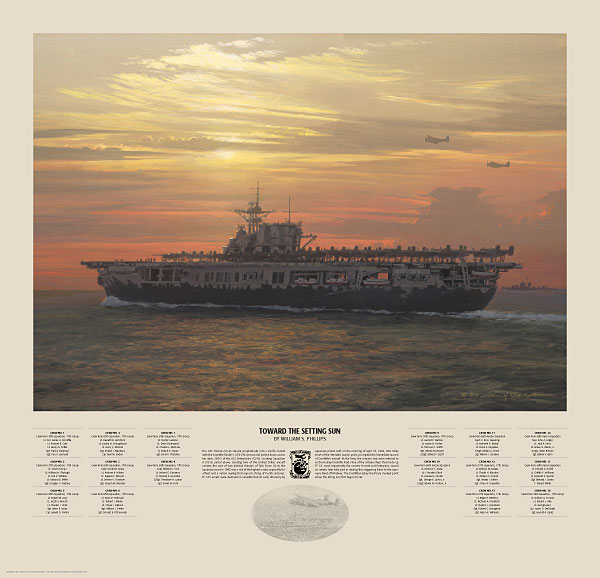 With this, the sixth release of artist William S. Phillips’ series on the Doolittle Raiders, the artist and the surviving members of the Raid pay homage the Navy’s role in the legendary raid on Japan. Sending two United States aircraft carriers to the coast of Japan in 1942 was a risk of the highest order for a fleet, and a nation, still reeling from Japan’s string of victories in the Pacific. The USS Hornet, loaded with the 16 B-25s (all that could be shipped) which would strike the Japanese mainland in the “Halsey-Doolittle Raid,” steams eastward as part of Vice Admiral Halsey’s Task Force 16. The SBD Scout Bombers circling above would have been members of VS-6 flying from the USS Enterprise. 1. What is a Personal Commission? The Personal Commission was created by The Greenwich Workshop™, Inc. as a way to collect an individual work of an artist whose fine art prints often sell out and are difficult to find. You can “commission” your personal copy of a print during a set period. Delivery of completed prints begins shortly after the edition size is determined by the total number of orders received during the commission period. It’s simple! Prints may be ordered during the commission period March 12, 2010 through April 12, 2010. To place an order, contact your Greenwich Workshop authorized dealer for a a Personal Commission form. Each form must be accompanied by a deposit for each print ordered. All orders must be received by April 12, 2010. 3. When will prints be delivered? Delivery will begin April 26, 2010 and will include confirmation of the final edition size.